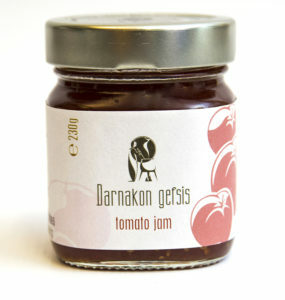 Jar: 230 & 830 g.
A special jam, with flavor and taste, that will fill you with excitement. Created by flavoring summer bright red tomatoes, sugar and cinnamon can accompany every plate of cheese and lunch meats, even burgers. You can enjoy it with cream cheese, cheesecake with mizithra cheese or, for those who dare, with kaimaki ice cream.